It’s the small and quiet moments that I’m always on the lookout for while doing Hiland Park Country Club Wedding Photography. In a quick and quiet moment, both the bride and groom hug the mother of the bride, thanking her for all the work she did on their wedding. Sure, there were plenty of great outdoor photos taken in beautiful locations at this Queensbury wedding. But I’m always looking for these moments where relationships and emotions on the wedding day shine through. These sorts of wedding photos that I take as an adirondack wedding photographer are the ones which will help you remember more than how your wedding day looked. They will help you remember how your day felt. 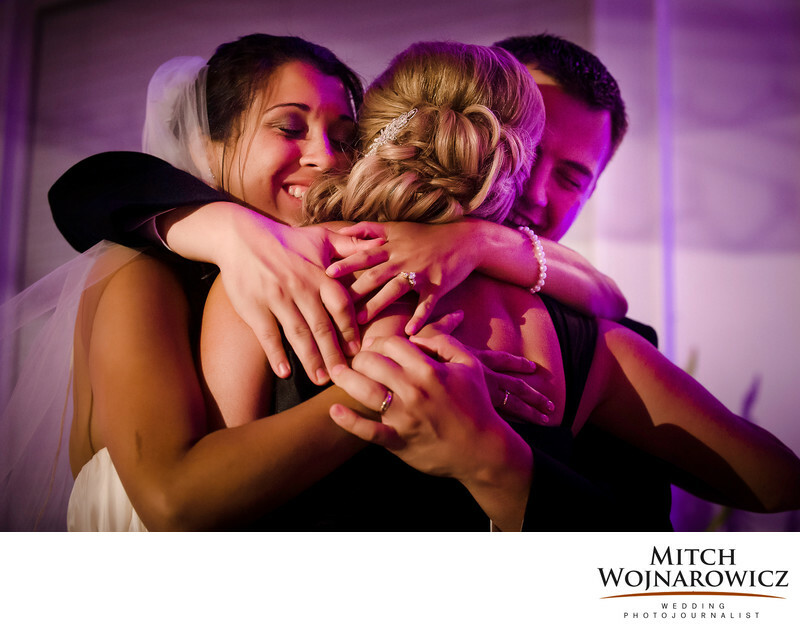 This is a heartfelt hug being shared between 3 people during their wedding reception. You can see the closeness of their bond and their relationship. It’s a great moment that didn’t need to be staged. It didn’t need to be interrupted nor managed. Many wedding photographers won’t let organic moments like this unfold at a wedding. They always want to create from a checklist. They will take parties away from the most important things to make a photo. After all, you are at a wedding to be together, to share the day together. And to visit with assembled friends and family. Not be subject to the whims of a traditional wedding photographer who will have you off posing endlessly. It takes years of training and having done diverse types of photography as a Glens Falls wedding photojournalist to be able to capture moments like this. Look at the body language as the hands of the bride and groom wrap around mom in this heartfelt wedding hug with her. It’s not just a photo that shows vanity. Nor one that is based on showing them standing next to a fancy car that they don’t even own. It’s a photo thats based on who they are and what is important to all three of them. Location: Hiland park country club. Keywords: adirondack (60), Hiland Park (3), queensbury (3).